Britons cannot end up with more rights than citizens from other non-EU countries after Brexit and the issue of limiting freedom of movement with the bloc will not be discussed until formal talks are launched, Italy’s prime minister said on Thursday. Matteo Renzi, who is struggling to boost his popularity ahead of a December referendum on constitutional reform on which he has staked his career, also criticised former Prime Minister David Cameron for holding the vote to placate his party. In a sign of Italy’s increased importance following Britain’s vote to leave the EU, Renzi held talks with Germany’s Angela Merkel and France’s Francois Hollande in Italy last month as the bloc tries to unite following the June 23 referendum. 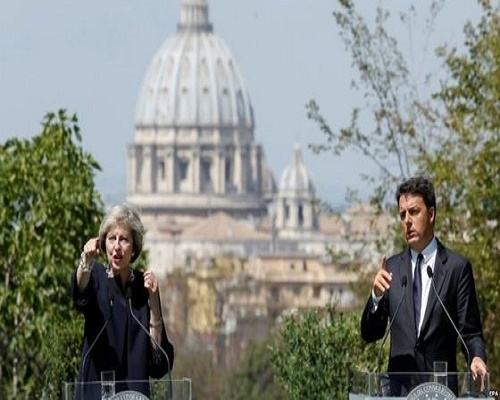 Renzi said that he respected the decision by 52 per cent of Britons to back Brexit but told the BBC that any deal could not give Britons a preferential status compared to those from other non-European Union nations. “It will be impossible to give to British people more rights than the other people out of the EU,” he said. Although Britain has yet to formally set out its demands as part of any Brexit deal, many in government are hoping to limit freedom of movement, a key reason why millions of Britons backed Brexit in a bid to reduce immigration, whilst maintaining business access to the single market. Asked about whether he was willing to be flexible, Renzi said the issue would be discussed once formal divorce talks begin. “This debate will be a debate about the concept of rules in the EU but when the UK will decide to open article 50, we will discuss it,” he said. Britain is not expected to trigger Article 50, beginning a two-year period of official talks, until early next year.